G.726 is used to convert 64 kbps A-law or μ-law PCM to and from a 40, 32, 24 or 16 kbps channels for carrying voice overload and data modem signals in DCME. Contact us to discuss your G.726 vocoder application requirements. VOCAL’s G.726 voice compression software is optimized for multi-channel applications on leading DSPs and RISC/CISC processors from TI, ADI, AMD, ARM, Intel and other vendors. G.726 codec implements the ITU recommendation and is available as a standalone algorithm, as a software library, or with a VoIP stack for integration options with user applications. Custom designs are also available to meet specific developer requirements. The G.726 algorithm makes a conversion of a 64 kbps A-law or μ-law pulse code modulation (PCM) channel to and from a 40, 32, 24 or 16 kbps channel. The conversion is applied to the PCM bit stream using an Adaptive Differential PCM (ADPCM) transcoding technique. The relationship between the voice frequency signals and the PCM encoding/decoding laws is fully specified for G.726 in Recommendation G.711. The principal application of 24 and 16 kbps channels is for overload channels carrying voice in Digital Circuit Multiplication Equipment (DCME). The principal application of 40 kbps channels is to carry data modem signals in DCME, especially for modems operating at greater than 4800 kbps. In the ADPCM encoder after the conversion of the A-law or μ-law PCM input signal to uniform PCM, a difference signal is obtained, by subtracting an estimate of the input signal from the input signal itself. An adaptive 31, 15, 7, or 4-level quantizer is used to assign five, four, three or two binary digits, respectively, to the value of the difference signal for transmission to the decoder. An inverse quantizer produces a quantized difference signal from these same five, four, three or two binary digits, respectively. The signal estimate is added to this quantized difference signal to produce the reconstructed version of the input signal. Both the reconstructed signal and the quantized difference signal are operated upon by an adaptive predictor which produces the estimate of the input signal, thereby completing the feedback loop. The ADPCM decoder includes a structure identical to the feedback portion of the encoder, together with a uniform PCM to A-law or μ-law conversion and a synchronous coding adjustment. 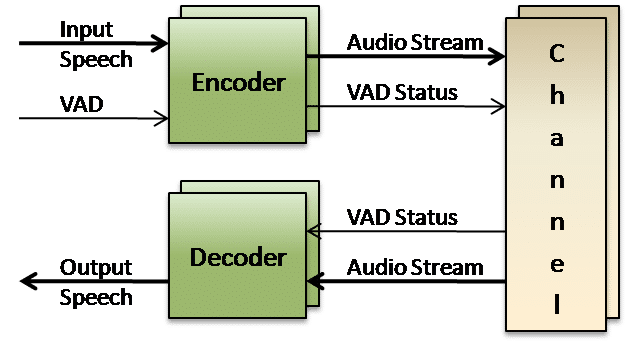 The synchronous coding adjustment prevents cumulative distortion occurring on synchronous tandem codings (ADPCM-PCM-ADPCM, etc., digital connections) under certain conditions. The synchronous coding adjustment is achieved by adjusting the PCM output codes in a manner which attempts to eliminate quantizing distortion in the next ADPCM encoding stage. VOCAL’s speech coders are available for the following platforms. Please contact us for specific G.726 supported platforms.